CBS has launched the CBS Mobile News Hurricane Center, a made-for-mobile severe weather resource that allows users to view late-breaking and targeted thunderstorm and hurricane updates. Mobile users will be able to access detailed statistics such as hurricane positions, projected storm paths and the latest category rating for storms in their area. PopularMechanics.com posted a special How to Survive Anything Checklist. They outline three disaster kits - one for your home, one for your car and one in a backpack for quick evacuations. The checklist is available as a printable PDF file. I started a Hurricane Survival Kit years ago (even before Katrina). I grew up on the Mississippi Gulf Coast and all of my family still lives there, so we spend a lot of time telling "hurricane stories." Like "Remember when we ate so much steak that we got tired of it?" And "Remember when you took a cold shower and it felt wonderful because it was so hot in the house"? Well, enough about me. 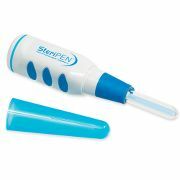 This little contraption, the portable 48-second purifier, would be a good item to add to your Hurricane Survival kit. It was named one of Time magazines Inventions of the Year. It is the only portable handheld water-purification device that uses ultraviolet light to purify 16 oz. of clear water per use in a mere 48 seconds or 32 oz. of water per use in 90 seconds. The ultraviolet light destroys microbes such as giardia and cryptosporidium, eliminates 99.99% of viruses such as hepatitis and poliovirus, and kills 99.9999% of bacteria such as Salmonella and E. coli. It's hurricane season. And time to stop the cabinets. Datrex Food Ration 3600 kcal. Emergency alert radios/weather alert radios for advance warning of impending bad weather as well as other local, state or national emergency warnings and alerts. Two extra sets (or more) of batteries for each electronic device that requires them Wireless phone and an extra phone battery. In-car wireless phone charger in case you lose electrical power in your home. Power inverter to allow you to operate such things as laptop computers and battery chargers from your car’s power adapter in case you are displaced from your residence. Flashlights, extra bulbs and batteries. Corded “land-line” (wired) telephone to allow communication even if you lose electrical power. Surge protectors to help protect expensive electronics and appliances. Battery-operated television and/or AM/FM radio to keep track of local news and alerts. Short-wave radio for emergency communication. GMRS/FRS 2-way radios to stay in touch with friends and family in the surrounding area or monitor NOAA weather information. Video or digital still camera to inventory home and personal property before and after an emergency situation for insurance or recovery purposes. Home security system back-up batteries in case you lose power for an extended time. Watching for changes in the inner eyewall of a hurricane may help forecasters overcome one of the challenges of hurricane predictions - predicting sudden strengthening or weakening. The ability to predict a hurricane path has greatly improved of late, but anticipating changes in intensity has remained a problem. Now, a research team led by Robert A. Houze, Jr., a University of Washington professor of atmospheric science, is reporting evidence that clouds around the eyewall of a storm can cause sudden changes in intensity. The findings, in the March 2 issue of the journal Science, are based on analysis of data collected in 2005 during Hurricanes Katrina and Rita. 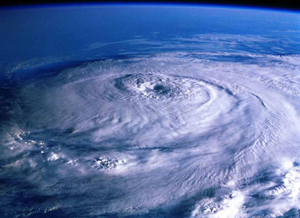 The strongest winds in a hurricane circulate in the cloud wall that surrounds the eye of the storm. Taking measurements from aircraft flying into these storms, the researchers led by Houze found that occasionally a "moat" of clear air will form outside the eyewall. Winds funneling toward the center of the storm will then form a new eyewall outside the original one, cutting off the storm center from the incoming flow of energy and eliminating the old eyewall. Because the new eyewall is larger than the old one, its winds circulate more slowly — as an ice skater with arms extended spins more slowly than one with arms held close to the body — thus reducing the intensity of the storm. But the new eyewall can then begin to contract, spinning faster and faster and increasing the storm's intensity. Scientists at the Northern Gulf Institute at Stennis Space Center are studying ways to improve hurricane forecasts. The federally funded center brings together dozens of researchers who also study ecosystem management, coastal wetlands, climate change and coastal hazards in and around the Gulf of Mexico. The new institute - one of 21 supported by the National Oceanic and Atmospheric Administration nationwide - includes scientists from Mississippi State University, the Univeristy of Southern Mississippi, Louisiana State University, Florida State University and Dauphin Island Sea Lab. One of the things they are working on is a 96-hour forecast vs. a 72-hour forecast, David Shaw, the institute's director, told Michael Kunzelman of the Associated Press. A wall of wind hit a suburb west of Miami last week with 115-mph winds and driving rain. Researchers at Florida International University created the Wall of Wind - which is actually a pair of eight-foot fans designed to simulate hurricane conditions. The machine could help scientists unlock the secrets to building safer and stronger houses. The 1950 concrete block had seen better days and was slated for demolition - the two-bedroom, one-story home was deemed a complete loss after the 10-minute assault. All in the name of research. 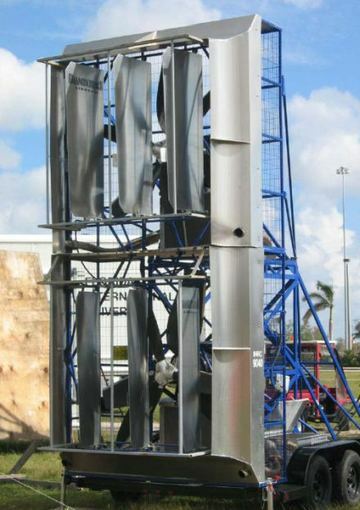 The portable Wall of Wind and a six-fan version now under construction at FIU's engineering campus are prototypes for the mega wind machine the hurricane research center hopes to construct by next summer. It will be a 45-foot wall with 18 giant fans that can pound an entire house with 160-mph winds. That's equal to a top-of-the chart category 5 hurricane. Such a facility, which is contingent on FIU receiving a $5.8 million grant from the state, would for the first time allow scientists and manufacturers to take the guesswork out of how and why houses fail during storms. Big enough to accommodate the 18-fan apparatus and a 2,400-square-foot house, the prefabricated steel building would help resolve one of the biggest obstacles manufacturers and engineers have when testing building materials and designs to withstand hurricane-force winds: size. For now, the wind resistance of doors, windows, roof tiles and other housing components are tested in wind tunnels barely big enough to fit a human. As a result, testers depend on miniature models. The inspiration for the Wall of Wind was the Insurance Institute for Highway Safety's Vehicle Research Center, where new cars are routinely crashed into walls. Just as crash tests led to the introduction of air bags and other safety features, Leatherman predicts the wind walls will lead to innovations by builders and manufacturers and change the demands of consumers. It's attracting notice from the insurance industry. RenaissanceRe Holdings Ltd., one of the world's largest providers of hurricane reinsurance, contributed nearly $380,000 to the development of the six-fan Wall of Wind, which will be capable of pounding a section of a house with winds up to 140 mph. The Southeast's climate provides more than just hurricanes during the hot summer months - humidity is also in abundant supply. And now companies are producing machines - water generators - that pull the humidity from the air and turn it into drinking water (which is in scarce supply following a hurricane). The biggest machines can make 5,000 liters of water a day, enough to provide about a gallon to 1,250 people. Small units cost several hundred dollars, while bigger, more elaborate machines can go for as much as half a million. The National Science Board's draft report, Hurricane Warning: The Critical Need for a National Hurricane Research Initiative, recommends a streamlined, multi-agency effort to improve hurricane science and engineering research, along with about $300 million in additional annual funding. The report says that the money needed for the efforts pales in comparison to the billions of dollars taxpayers cough up each year for the cost of hurricanes to our nation. Hurricane-related losses in the U.S. totaled $168 billion in the last two hurricane seasons, and 1,450 storm-related deaths were reported, according to the report. In comparison, total federal funding for hurricane research totaled $200 million - and annual funding for the government's "focal point" for storm analysis, the National Oceanic and Atmospheric Administration's Hurricane Research Division, has never exceeded $5.1 million, and its staff has declined by 30 percent over the past decade. Most hurricane-related funding is focused on short-term forecasting efforts, with less than two percent aimed at improving structural design and engineering for buildings. Additional funding could be used to improve observation with satellites or unmanned aircraft that collect data at the water's surface. The board's recommendations for a National Hurricane Research Initiative are outlined in legislation introduced Sept. 29 by U.S. Sen. Mel Martinez, R-Fla. NOAA and the National Science Foundation would coordinate the initiative. Its highest priority would be predicting hurricane size and intensification, where hurricanes will make landfall and the severity of storm surge and flooding. The public is invited to provide e-mail comments of the draft report to NSBHSE@nsf.gov until Sunday, October 29, 2006.